For two weeks starting today, and only for two weeks, comics will be posted Mon-Wed-Fri. After that we will revert to Mondays only. An overhead sign says: Stereo Department. Woman: I need cables for my very powerful stereo speakers. Man: I’ll get you monster cables. The man's arms are outstretched. The next panel shows a man in a forklift truck. The forklift truck carries a large box that contains what might be huge cables. 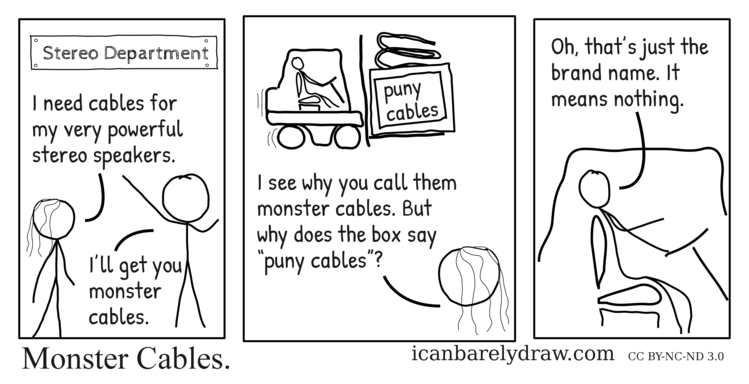 A label on the side of the box says: puny cables. The same woman's head is seen in the foreground. Woman: I see why you call them monster cables. But why does the box say “puny cables”? Man in forklift truck: Oh, that’s just the brand name. It means nothing.